Parodying St. Louis sports, tech and the world in general. Missouri Governor Jay Nixon has decided to forgo the usual World Series “my beer VS your clam chowder” bet and instead has decided to be more sensible with his offering. If the Cardinals lose, Nixon will send Massachusetts / Beantown Governor Deval Patrick and each and every citizen living in the city of Boston a lifetime online subscription to Rosetta Stone – English. In a statement Monday, the Governor of Massachusetts, Deval Patrick said he thought the idea was “retahded”…and “bzah”. Governor Patrick added, he was so upset by the affront that he was grabbing his khakis = what we staht the cah with, and running over the first Cahdnal bird he could find. Nixon Countered by quickly passing a “Hate Proper Speech” law requiring every visitor to the great state of Missouri, when speaking, to use all twenty six letters in the alphabet and anyone caught dropping the letter “R” out of their vocabulary will receive “foddy” strokes less one or at the very least have their Boston Baked Beans quarantined. COMPLETED CONTEST: Win 2 Free Tickets to the Cardinals VS Giants game on Thursday! Lumpy Rutherford is the head writer for the Toast Dispatch. His favorite topics are St. Louis Post-Dispatch writer Jeremy Rutherford and former Blues goalie Jaroslav Halak. 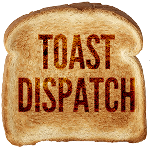 Toast Dispatch Radio with Nick & Nick is a weekly podcast covering St. Louis sports. Subscribe to be notified of future episodes. 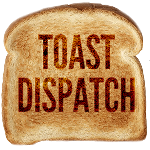 Get a short email each month letting you see the latest articles on the Toast Dispatch! Where will the Blues finish in the Central this year?